I listened to this album many times but somehow none of the songs stuck with me... maybe next time. 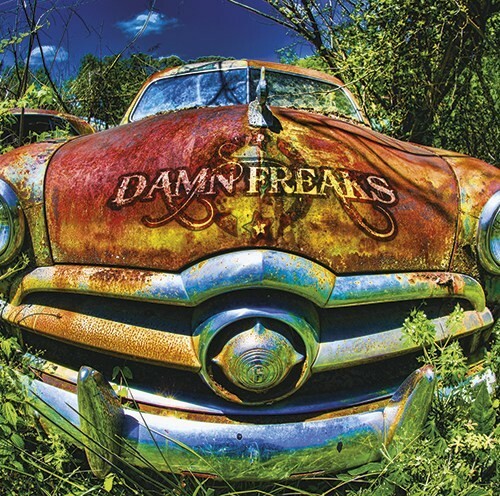 Damn Freaks are Jacopo "Jack" Meille on vocals (also the voice of Tygers Of Pan Tang), Marco Torri on guitar, Claudio Rogai on bass and Matteo Panichi on drums. 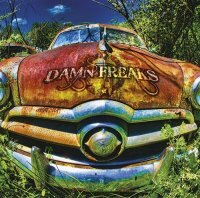 Coming out of a previous band Fools' Moon and based in Florence Italy, unashamed eighties fan Panichi said "In a way, we consider ourselves the freaks of the third millennium as we still want to have a good time and music is the perfect and 100% legal drug". From the write-up, these boys are very enthusiastic about what they do. In publicity, they talk about capturing the vibe of the eighties and standing up to songs like 'Panama'. To be honest, that's a pretty high bar and I'm not sure they are there yet. They can play and sing but, for me, it's the song-writing which mainly means they can't be said to have reached their avowed goal. It's interesting that they mention White Lion as I think the production on the first White Lion album did not show off Mike Tramp's voice, and maybe that's the case here, but there is a slightly tinny effect on the vocals. Certainly, the guitar playing is highly proficient and I have no argument with that at all. However, some of the songs are quite slow and just don't have the fast-paced vibe or devil-may-care attitude of the eighties, almost as if the nineties can't be unseen. I have heard other albums that have, to a greater extent, sounded more successfully like they were made at the high point of the eighties. I guess being a fan and producing the same material are two different things. In fact, this album reminds me more of the early nineties, a time when many successful bands of the late eighties produced difficult second albums as if they were trying too hard. Whilst it might technically tick off a checklist of everything that should make a good album, somehow the overall magic of (for example) the first Skid Row or Babylon AD albums just isn't there, nor are the quality tunes. I listened to this album many times but somehow none of the songs stuck with me... maybe next time!